Tonight on ITV the inimitable pub landlord, Al Murray, amongst others, will be discovering the secrets of their ancestors’ lives. One of Murray’s ancestors was committed to an asylum and the show will follow his discovery of what that meant for her and the other asylum “inmates”. 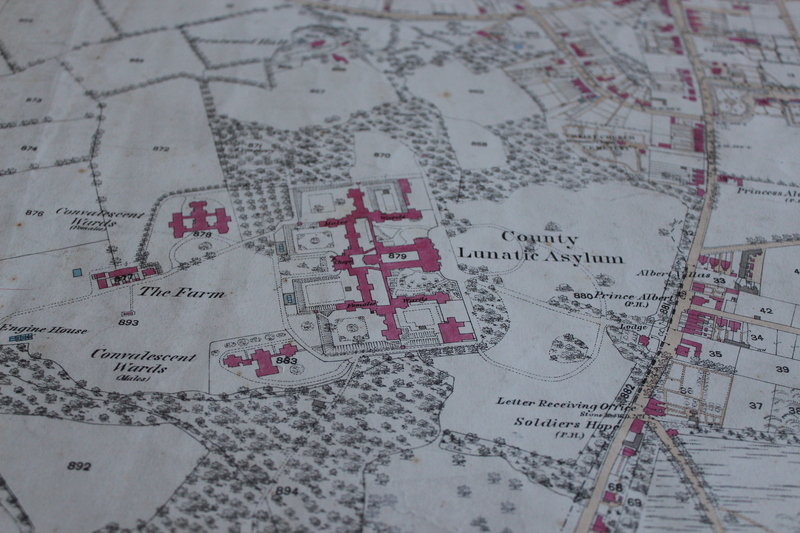 After The Asylum Act of 1845 it became a requirement for each county to have its own asylum. The Justices of the Peace in Essex opened their County Asylum at Warley near Brentwood in 1853 at a building cost of some £66,000. It was then designed to hold 450 inmates. The institution finally closed its doors in 2001 and much of the site has now been re-developed into luxury flats. 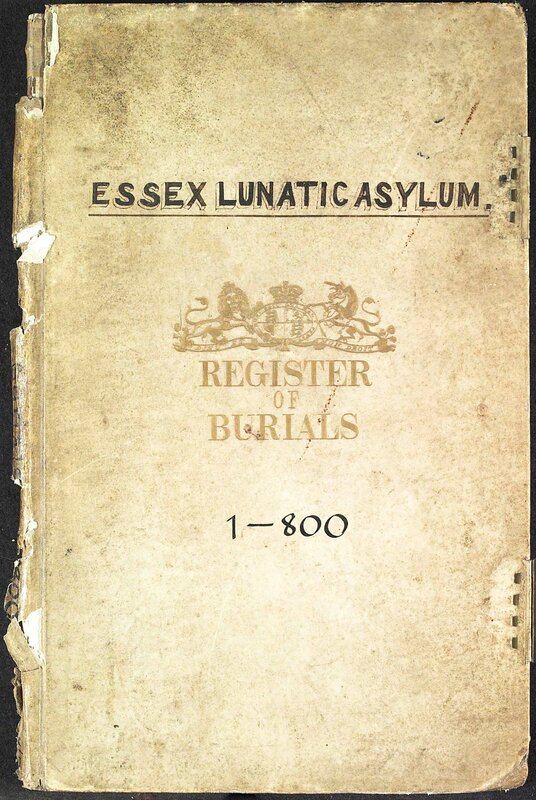 To get a flavour of what the asylum was like at the end of its life this website has a number of very good pictures. 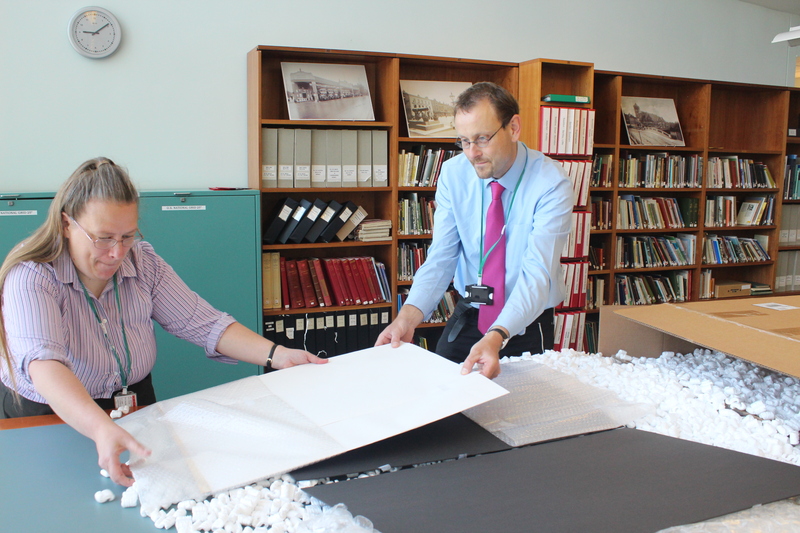 Those documents which had survived the passing of time and the closing of Warley Hospital have now been passed to us at the Essex Record Office. 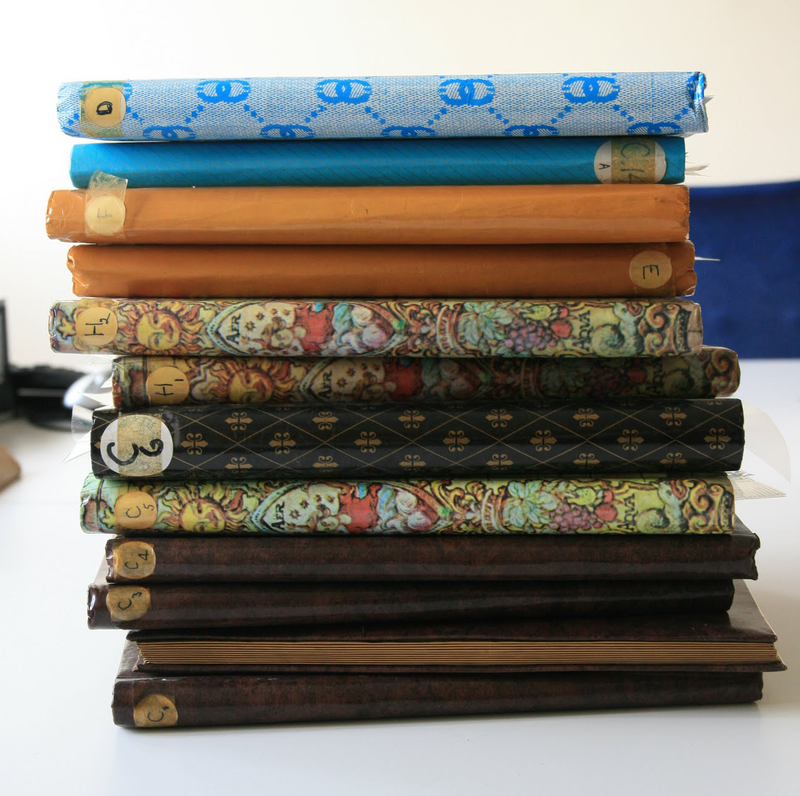 These include Managers’ Minutes, Reception Orders, Case Books and Patient Indexes. 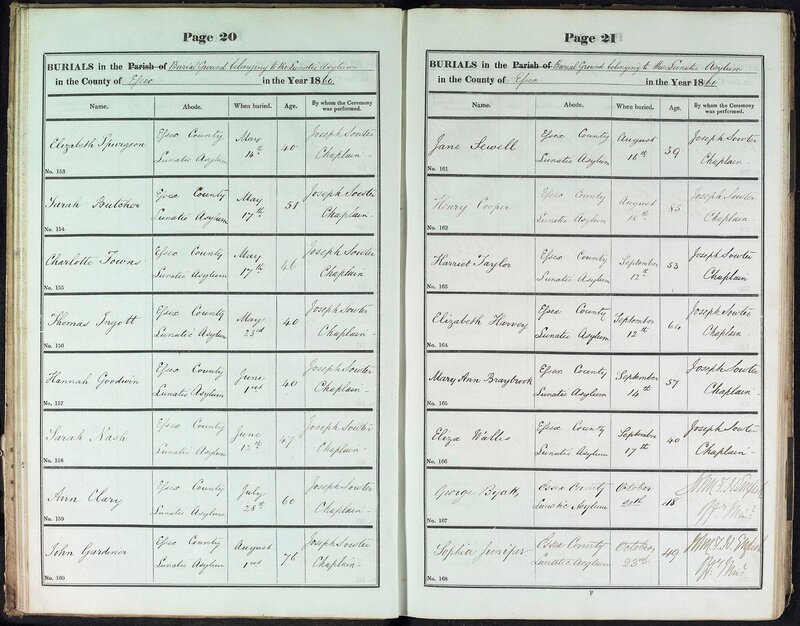 We also have a range of Burial Registers which were kept by the Justices of the Peace. 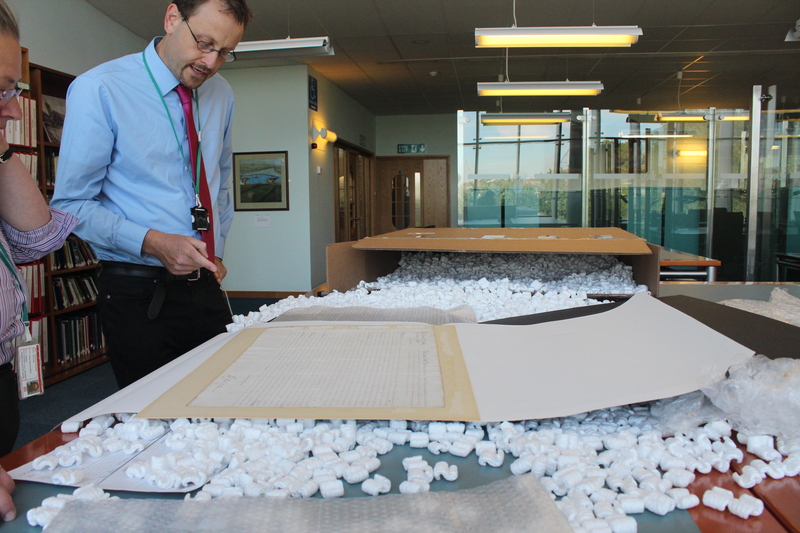 The majority of these documents fall under our A/H 10 reference and many of these can be searched in the Record Office, though it is worth bearing in mind that most records less than 100 years old are closed to the public and will have to be searched by one of our archivists (the exception to that being the Burial Registers which are held under references Q/ALc 12/1 to Q/ALc 12/5 and these are currently available to view on our catalogue Seax). 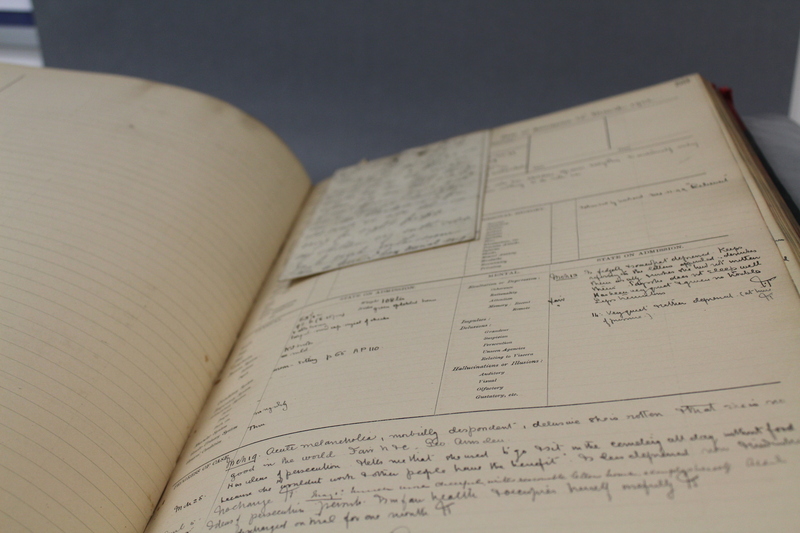 If you are interested in what you discover with Al Murray tonight and want to find out more about life in the asylum or if you think you may have a relative who may have been in the County Asylum, please feel free to visit us or get in touch to discover the secrets that our records might hold. 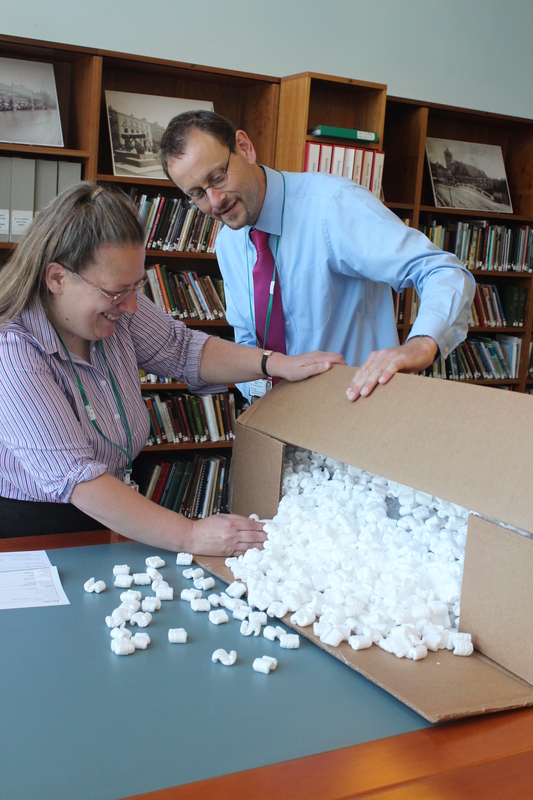 After our recent posts on how to run a manor, what a manor was, and the records produced by manorial courts today we had an exciting package which arrived from Professor Lawrence Poos all the way from America. 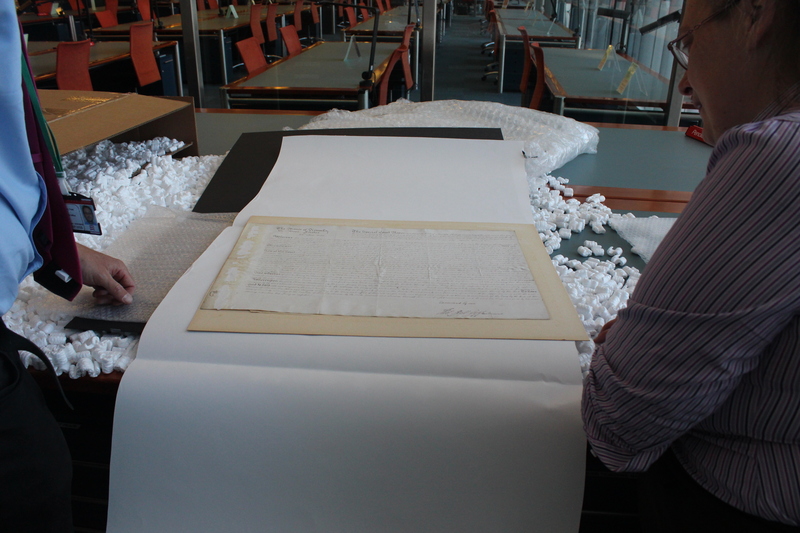 It’s another manorial document for our collection! 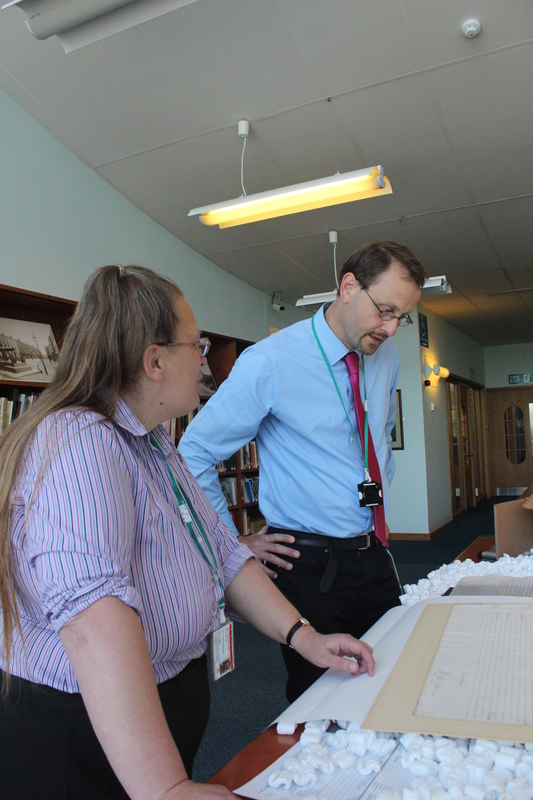 You can find out more about manorial records and how you can use them in your own research from Professor Poos and others at Essex through the ages: tracing the past using manorial records on Saturday 12 July 2014. 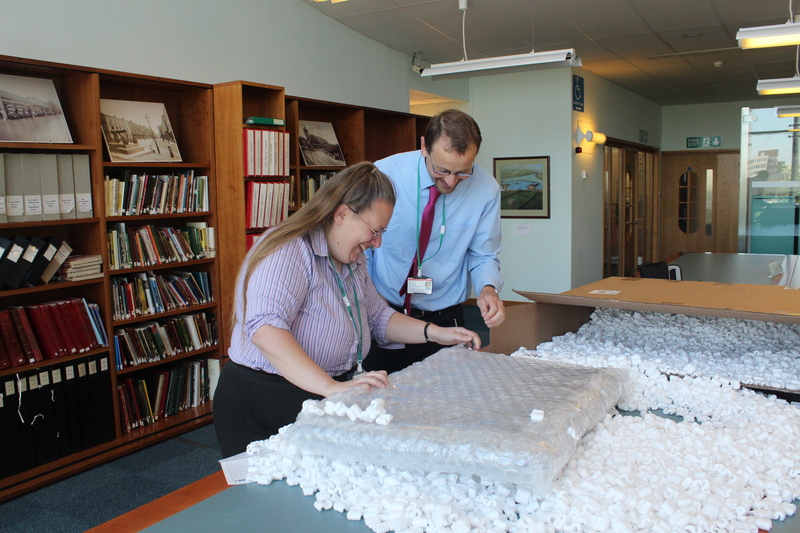 ERO Archivist Katharine Schofield and Public Service Team Manager Neil Wiffen eagerly anticipating opening the package! 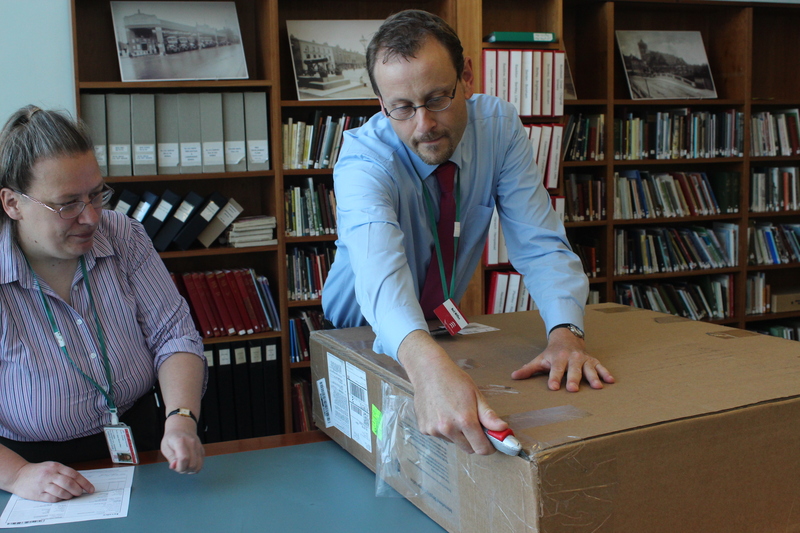 We thought we’d provide a little photo story of the unboxing. 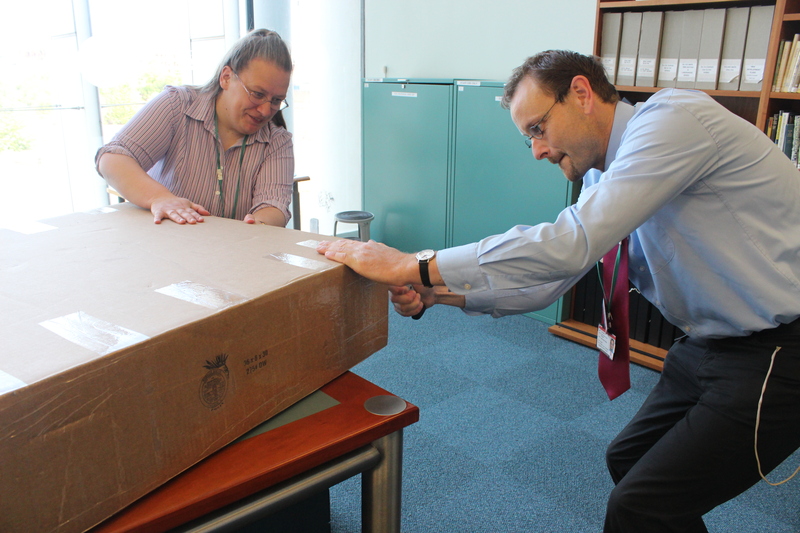 I think the pictures below will give you some idea of the lengths people go to to transport the documents they want to deposit with us. 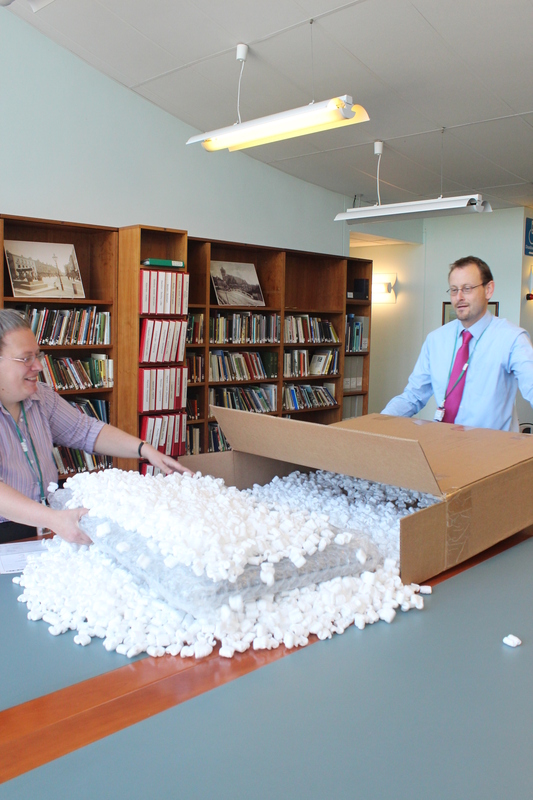 Documents arrive with us in all sorts of forms and conditions and it is always exciting to unwrap them for the first time. As always, stay tuned for more details about this new document! Don’t worry, Neil is a fully trained knife wielder. Hey Presto! 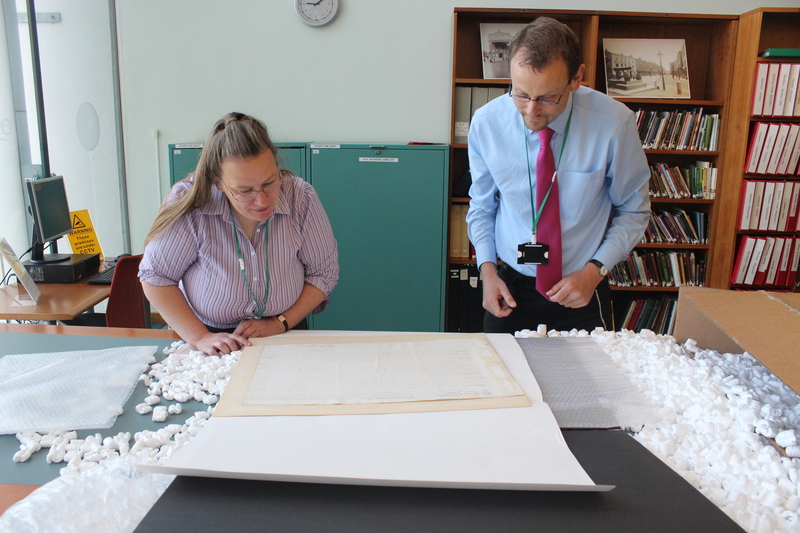 One new Copyhold Deed for the Essex Record Office Collection. 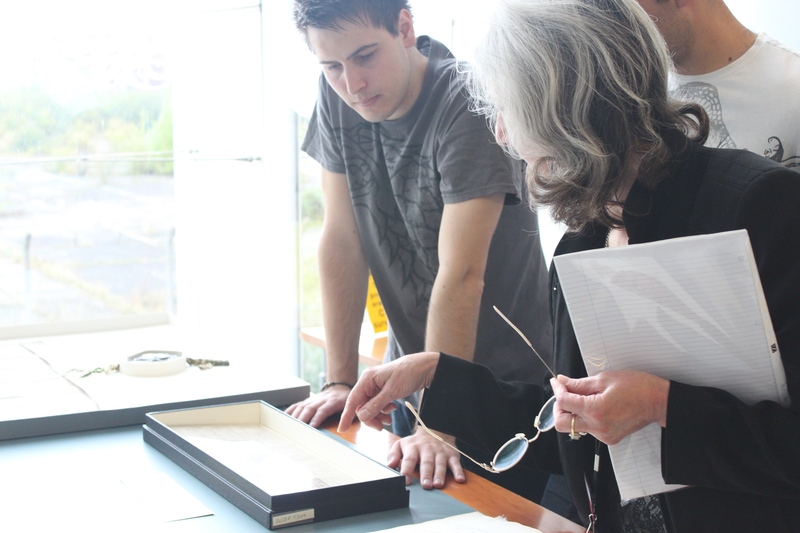 Whether you are interested in using manorial records in your own research, or just want to enjoy hearing experts talk about them, join us for Essex through the ages: tracing the past using manorial records on Saturday 12 July 2014 to find out how you can discover centuries of Essex life using these fascinating documents. There are more details, including how to book, here. 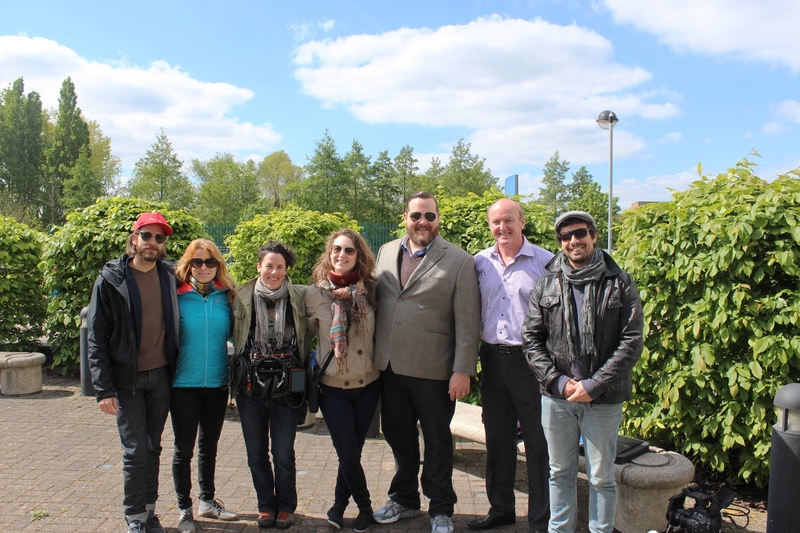 The crew and local expert Patrick Denney spent an enjoyable morning filming for the episode which features the award winning actor Antoine Bertrand. A number of our original documents were consulted but we won’t let on which in case some of our Canadian readers get upset. Do you have any North American connections among your ancestors or does your family history wend its way back to British shores? 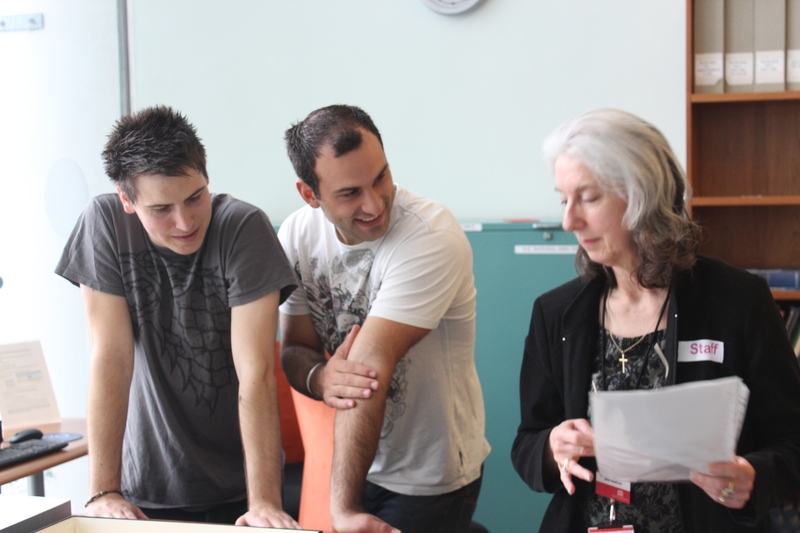 Either way it can be a frustrating but rewarding obstacle to overcome in the course of your research and hopefully the Essex Record Office and our colleagues in the UK and elsewhere will be able to help you. After a thoroughly enjoyable Heritage Open Day on Saturday, I am sure you will forgive us a brief hiatus in the social media sphere. We all had a great time and we hope you did too. It was great to see so many people, roughly more than 500 came through the door by our closest estimates and every tour was packed. In fact, in the the end we had to lay on a few additional tours to ensure as many people could enjoy a guided tour of our searchroom or a visit to our conservation studio (from which one of my friends returned green with envy, saying “Some of the kit in there…fantastic!” He may have had too much blue icing though. 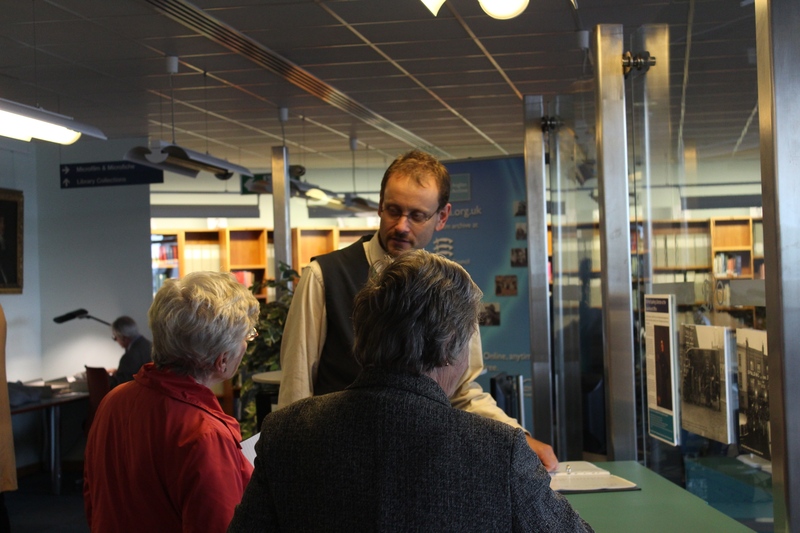 Our thanks must also go out to all our lovely volunteers without whom the day would not have been possible. I thought I should share with you a few of the photos from the day, there are many more to follow. 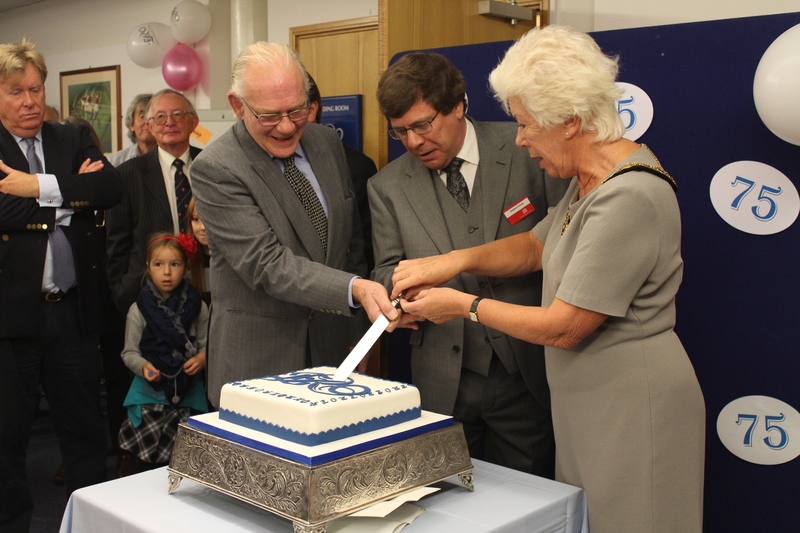 Lord Petre, Lord Lieutenant of Essex, Councillor Kay Twitchen, Chairman of Essex County Council and Stephen Dixon, Archive Services Manager, cutting our 75th Anniversary cake. 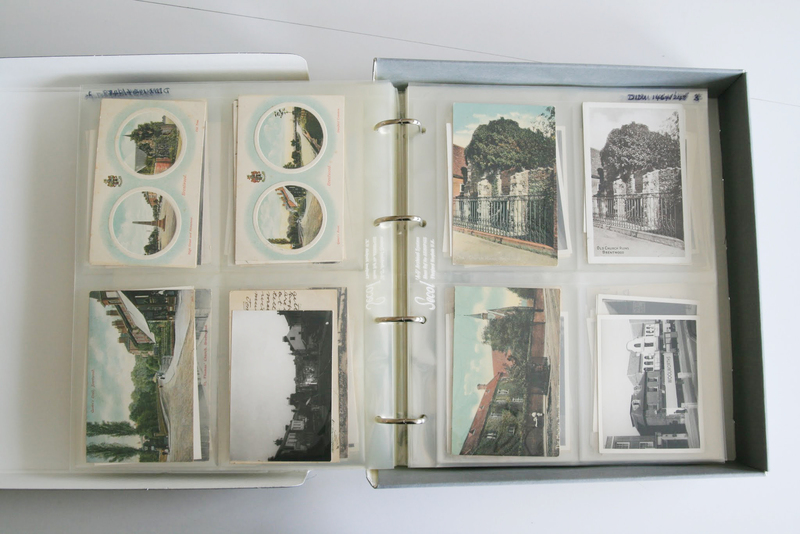 This collection consisting of 112 boxes of photograph and postcard albums and slides was compiled by Geoffrey A. Robinson of Thundersley, Essex. 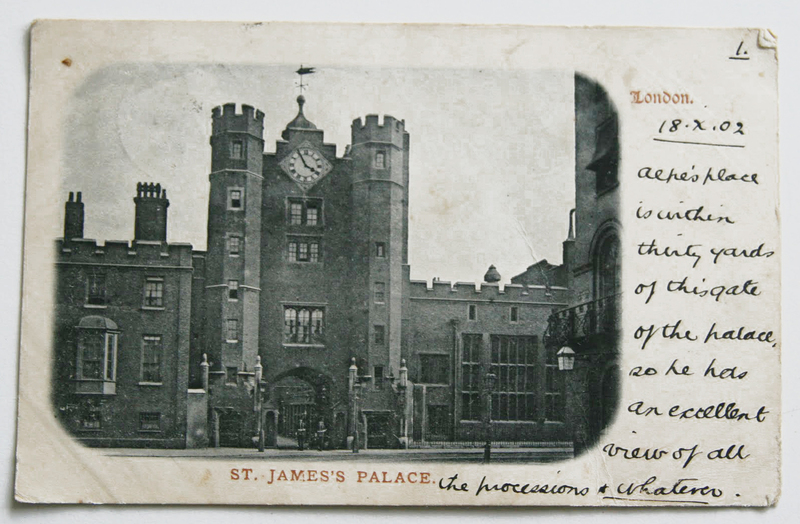 A keen photographer he also collected postcards, chiefly of places in Essex but also all over the country. Mr Robinson had a clear plan when taking his photographs of places in Essex. He would start with the parish church and take exterior views, then move inside, including any memorials or noteworthy architectural features. He would then take the churchyard including inscriptions on larger memorials. Then he would tour the village taking photographs of old buildings, public houses, the school, and any other religious buildings e.g. chapels. He was most active during the 1960s and 1970s and his photographs provide a wonderful window back in time to the quiet lanes of Essex with no cars in sight. 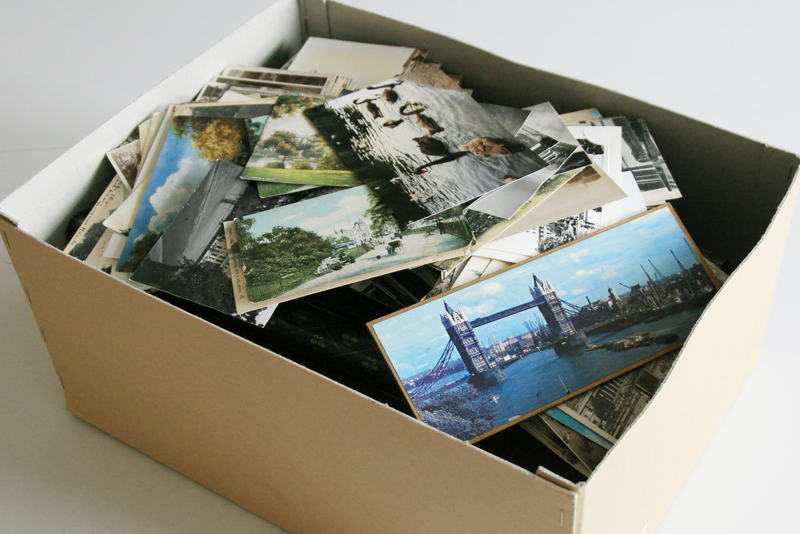 He put all his photographs and postcards into albums, initially using photograph corners on paper pages but later using the dreaded self-adhesive lift-and-stick plastic pages. 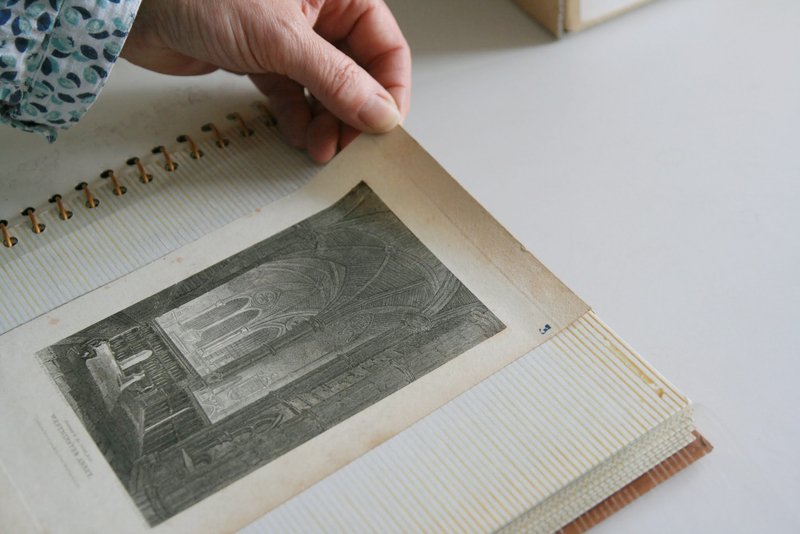 These are a particular problem as the adhesive remains sticky and holds the image so firmly to the page that it cannot be removed without damage. 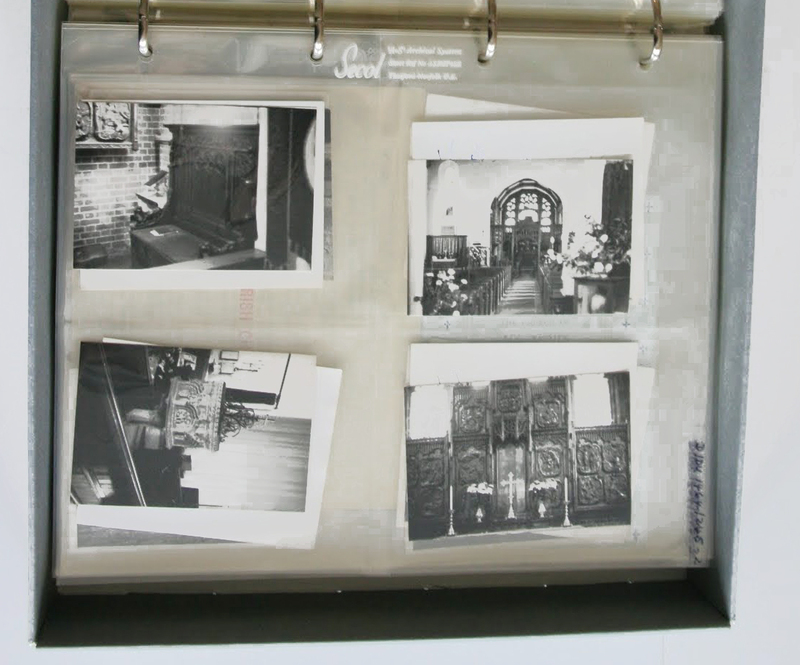 Fortunately, for most of the albums in the Robinson collection the adhesive has dried so much that the photographs and postcards can be removed easily. 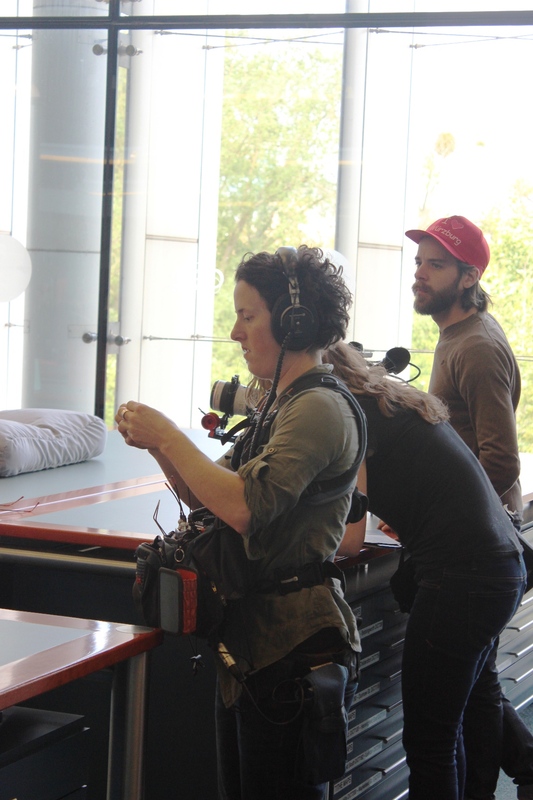 The images are being been re-stored in inert melinex pockets which will ensure their preservation for years to come. 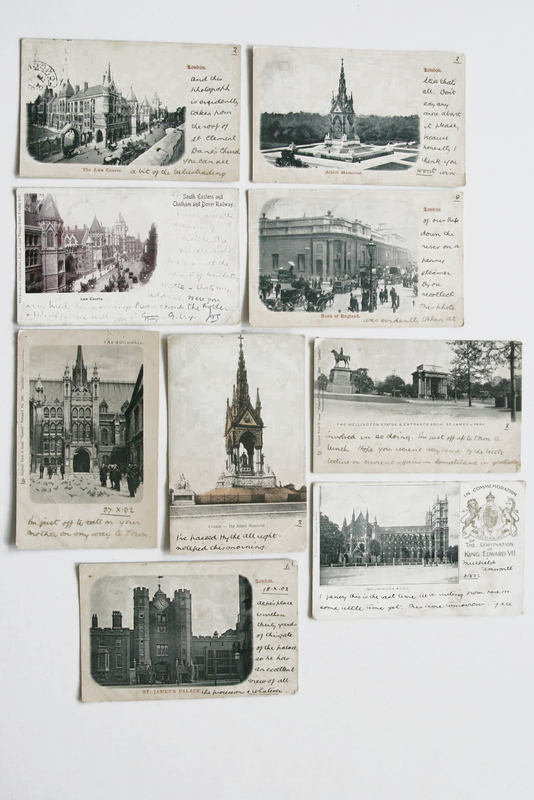 Postcards relating to other counties have been sent to the relevant offices (about 40 at the last count!). One of the mysteries of the collection is the correspondence with a Miss Raverty. 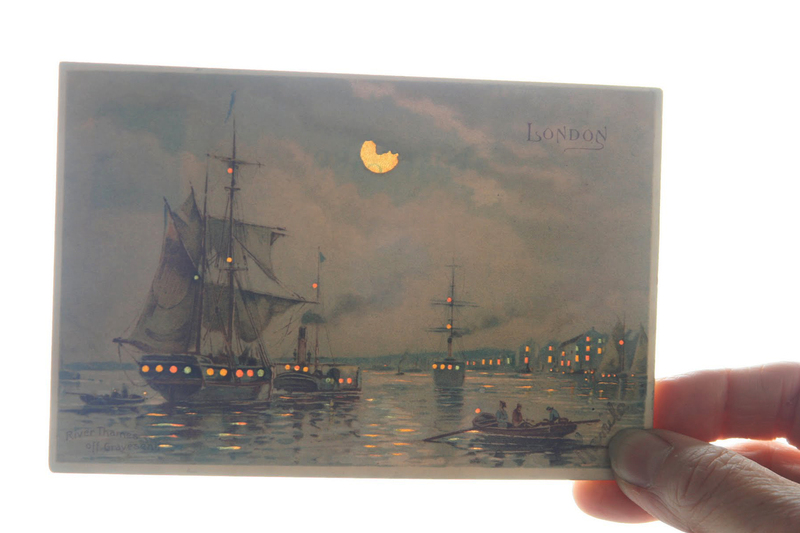 The author of the postcards seems to have written to her frequently, and would spread individual messages across several postcards, which were then numbered. We have tried to put the sequences back together, but cannot make much sense of them as yet! 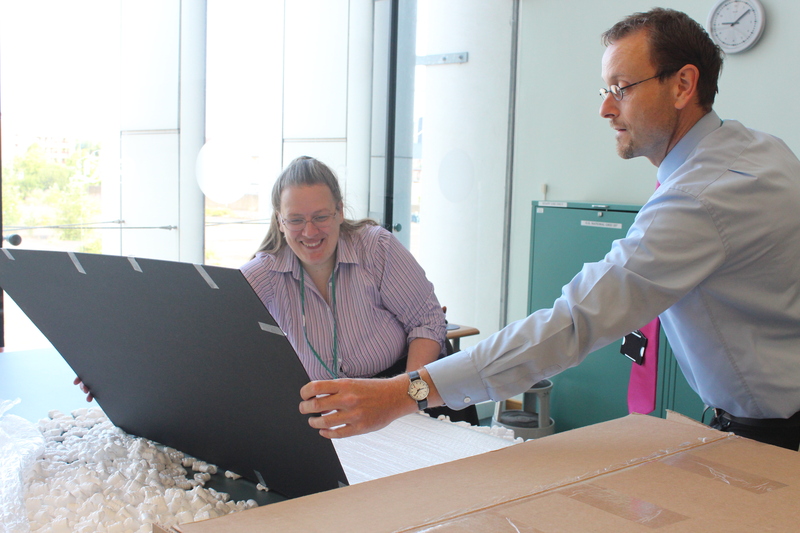 We thought that a good place to start our new blog was at the ‘beginning’ of our collection, so here Archivist Katharine Schofield introduces the oldest document in our collection. 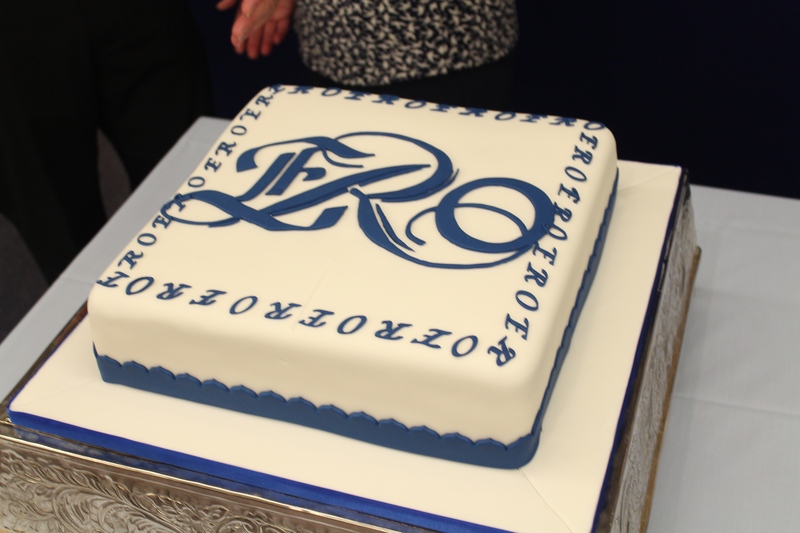 The oldest document in the ERO is over 1,000 years old. It is an Anglo-Saxon charter (catalogue reference D/DP T209) which dates from 962, in the reign of King Edgar. It is a grant of land in South Brent, Devon by King Edgar to one of his ministers Ǽthel[wine]. 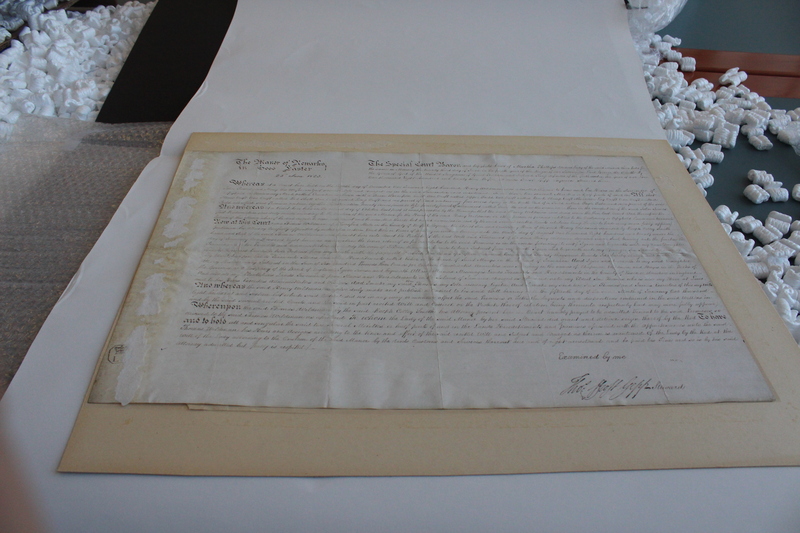 The land later came into the possession of the Petre family, who originated from Devon and became an important Essex family, and the charter forms part of the extensive Petre collection held at the ERO. The first part of the charter is written in Latin. The second part which describes the boundaries of the land (e.g. ‘by the lane as far as the earthwork’) is written in Anglo-Saxon. Unlike medieval deeds this charter is not sealed but has a long list of witnesses, beginning with King Edgar. The witnesses include bishops, ealdormen (royal officials) and ministers and Dunstan (later St. Dunstan), Archbishop of Canterbury. But unto any who should lessen or infringe this my grant (far be such a thing from the minds of the faithful) be their portion with those on the other side upon whom is pronounced the sentence ‘Depart from me ye cursed into everlasting fire which was prepared for Satan and his followers’.